Some visualizations will be image-based graphs, some will be interactive, all are fair game for questions, comments and further exploration. If a visualization is interactive, it'll clearly say so. Also, each post will begin, as this one does, with how many institutions are reporting so that you can get an idea of what the data represents and how it's changed. Click image below to visit a larger, interactive version of the graph (opens in a new window) and then come back here and answer the questions I've asked below. Which kit activities will you do again next year? Which kit demos/activities won't you do again next year? How come? p/s. 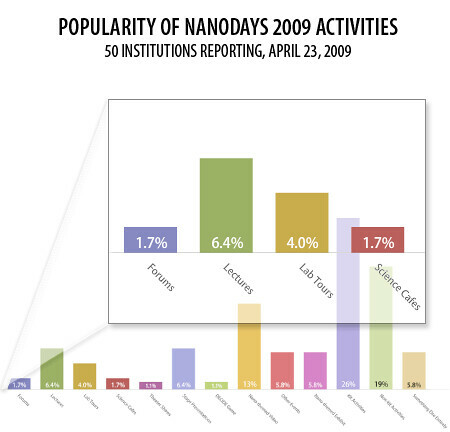 Bookmark or subscribe to this blog - www.nisenet.org/blogs/nanodays - as I'll be updating several times a week.